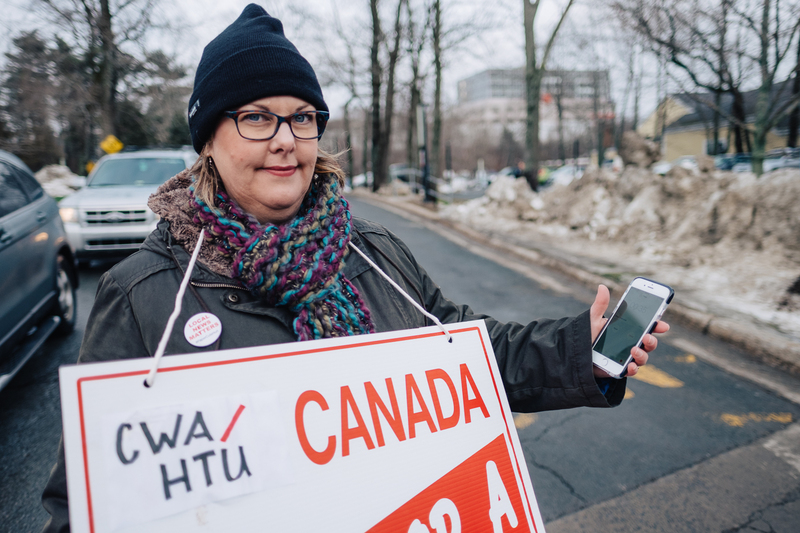 Pam Sword, digital news editor at the Chronicle Herald who is on the picket line, said a lot of reporters never stopped working even after the strike was called. “People were going out and doing stuff even before we had the website up… We needed a bucket to put everybody’s stuff in because people wanted to keep working,” she said. Sword bought the domain and helped get the website up and running. She says there are three people running the website and contributors are submitting content and organizing via email, text and Dropbox. “People are paying out of their own pocket right now to cover stories,” says Sword. On Jan. 12, before the strike was announced, the Chronicle Herald removed all bylines from their stories indefinitely. This came after unionized members had their own one-day byline strike as a form of protest. Gorman continued to cover the legislature via Twitter after the strike started, but he had no place to publish his work. “I hated it. I’ve been blessed in what I do. I love working. I don’t celebrate hump day. I love what I do and not having an outlet for that was really frustrating,” he said. He says with the Xpress he’s able to focus more on the unique stories that come out of legislature, rather than fitting them in between routine updates and reporting. “We’re trying to get the stories that no one else has,” he added. Freelancing isn’t out of the question for striking journalists either. “You can’t sustain yourself on strike pay,” said Gorman. 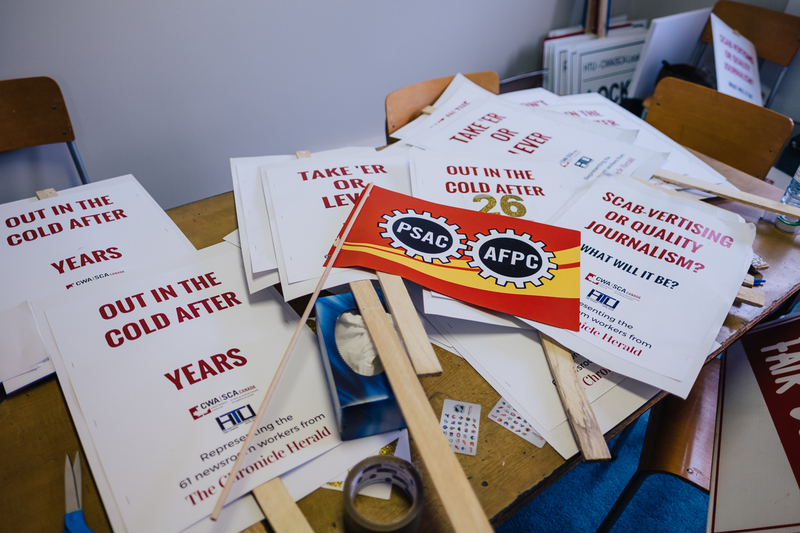 For editors and photographers the first two weeks of strike pay is around $200 a week and grows thereafter. Striking employees represented by the Halifax Typographical Union picket at both entrances of the Chronicle Herald building. The Union has agreed they are allowed to block cars from leaving the Herald driveway for up to five minutes. Drivers honk in support as they pass the picket line on Joseph Howe Drive. 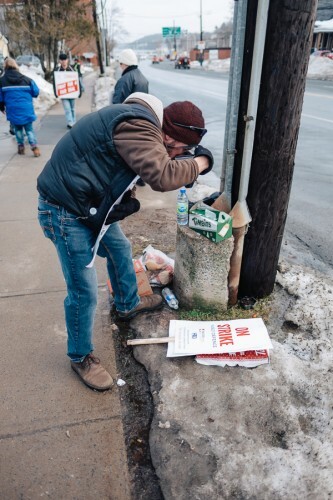 Striking photographer Christian Laforce jokes that the strikers’ biggest fans are Halifax Water employees. “I think they have the loudest horns,” he says. 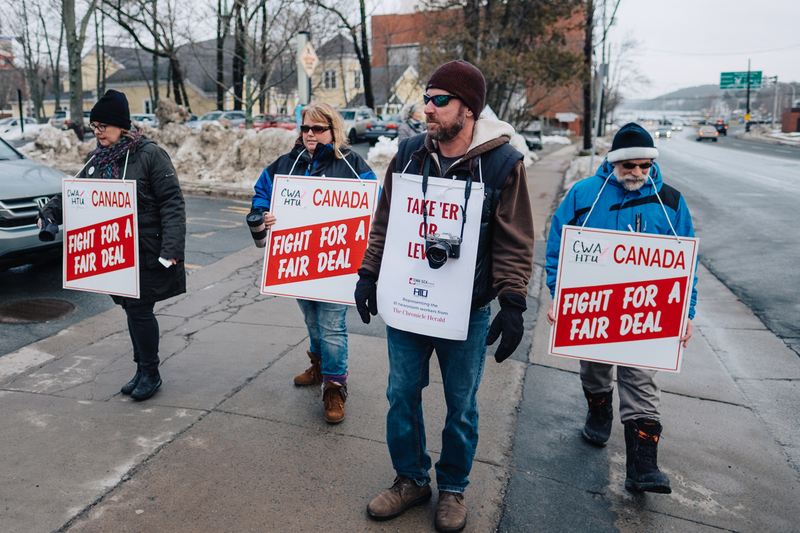 Halifax Water employees had their own strike last spring. It started in May and lasted two months. 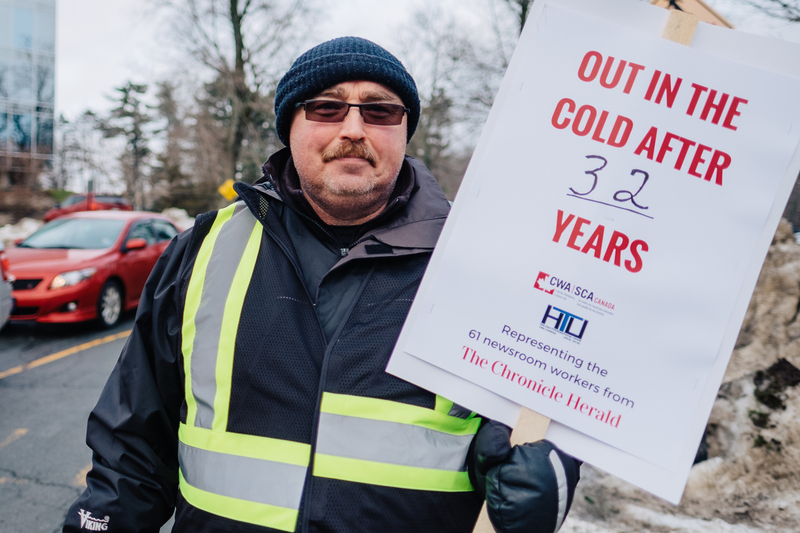 Laforce says, as a photographer who is usually working and filing from the field, one of the positive things about picketing is getting to spend time with co-workers. “You lose track of how much you actually like a lot of these people,” he says. Across the street from the Herald building and up a narrow set of stairs the union has rented space at St. James Anglican Church. This is where people walking the picket line come to warm up during their four-hour shifts. There is donated fruit, coffee, cookies and a Keurig that Sword says they “liberated” from the Herald offices. “We all chipped in and bought that when we were at the Herald so we took it with us,” she says. There are also blankets, hand warmers, a pile of picket signs and a sign-in sheet. Sword says they have new signs coming to advertise the Local Xpress. Sword says striking assignment editor Chris Lambie still acts as their assignment editor. Their website is simple, but Sword said they’re not trying to replicate the Herald. “We think content is what people are interested in. The photos and stories will speak for themselves… We’re doing the things we want to do that we think are important. The things we think readers will be interested in,” she said. Sword is also busy, saying a typical day involves 12 hours of juggling family commitments, replying to emails, updating social media and managing the Xpress website. A topic that comes up often amongst the striking employees is how hard it is on their families. My Aunt Claire has been an employee of The Chronicle Herald for over 30 years. At a very young age she was hit with a life changing event that left her husband with life long disabilities. Through over thirty years of marriage, her dedication to providing the love, care and support he and their daughter needed never wavered. I also know that The Chronicle Herald has been the foundation of her ability to provide for her family. She would not have taken this for granted one day. Her passion and commitment to The Herald has without question contributed to their success. So after 30 years of marriage to her husband Ed, you can be damn sure she’ll never come home to a locked door. He knows exactly how lucky he is. Only difference is, the word “money” would have no basis for her worth to him. The Chronicle Herald has locked the door. Claire McIlveen deserves that last day of work we all dream of. Where she can walk the floor and hug or shake hands with all those she has inspired and who have inspired her. There just has to be some good old fashioned honor and integrity left in this Halifax, NS newspaper that’s been a part of our family for 30+ years. Has to be. I hope that those who are running the Herald into the ground will loose their positions and the important contributors to the paper, those of you who are locked out, get back to a position where you are treated with the respect you deserve and a salary you can live on!